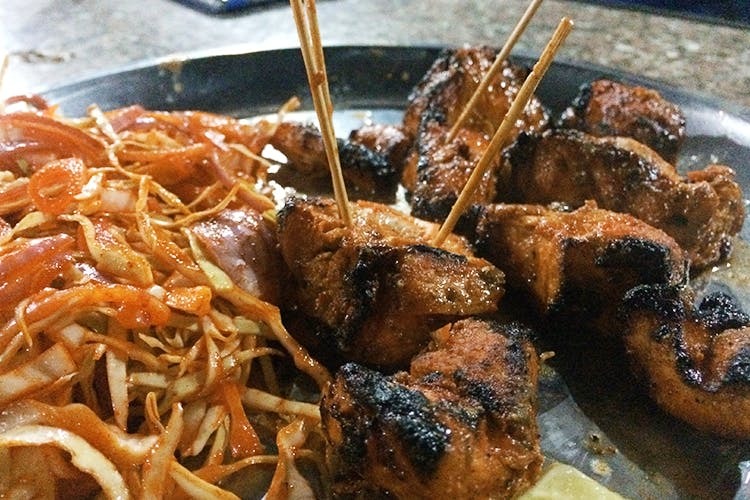 Mukesh Dhaba is where you’ll find typical dhaba food in Gurgaon, 24/7. We love visiting it for its tandoori parathas and chai at 4am. The Tandoori Chicken Paratha is absolutely fantastic; it’s baked in the tandoor to a crisp outside but the chicken inside remains tender. Each paratha is big enough to be a dance floor at certain clubs, mainly because there’s that much stuffing in it. Do try the keema paratha as well, its pretty good but not the best we’ve had, and hence we reckon tandoori parathas will always outdo tawa parathas by a mile and a half. The Aloo Pyaaz is good but can be given a miss. And if you feel the need for more, order the Chicken Tikka and the creamy Dal Makhni. They don’t make their own tea or coffee, and you can tell. That’s because the coffee is just bad — if you can call it coffee at all. Amongst sky high towers made of glass and fancy shopping spaces, this small little shack of a dhaba is a Punjabi midnight refuge. You will not be disappointed by the quantities. We’re told you can take your own booze here too.